That's a really beautiful basket, accident or not, gauge or no gauge! 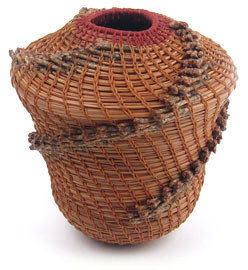 I've never tried coiling, but it fascinates me! I laughed out loud reading this...I can just picture you out there carefully picking up "mulch"! Even the other local basket makers thought I was a little crazy for picking up the needles. I kept trying to tell them they had cash laying all over the ground, but none of them were coilers so didn't share in my excitement. That is a lovely basket, Tony! I am impressed. Oriental is just down the road from where I live, and it constantly amazes me here,in the heart of where the longleaf pine grow, how few people have seen a pine needle basket. They DO think of pine needles only as mulch. Amazing! That is how they react to the baskets, too....amazing! Your basket has grace and i love how the sharp spiral of the fascicles opposes the more gentle spiral of the stitching. I also love the contrasted oriface at the top...very expressive! Of course, I am not surprised at all, considering your other work. Thanks so much for sharing your experience with us. Thanks for the nice complements. "Fascicles," so that is what they are called! I always just called them, "ends" ;-P Nice to know the real term. Oh, that is the only stitch I do. I am sure it has an official name, but I just call it a chain stitch. I like it because I can double the thread and the needle is capture. I love your blog and your baskets! Is there a recurring basket course in Oriental? I live due south 5 miles by water. There are few to no classes around the area and long travel is a no-go for me right now with three boys (13,15 and 55!). I don't think my friend Becky hosts classes anymore. It is a lot of work and unless you have a good base of students it can be hard to fill the more expensive specialty classes. If I have of any I will post them to my blog though. Thanks for the complements on my blog too.